Bosch, M.; Rodriguez Cantalapiedra, I.; Sabaté, J. 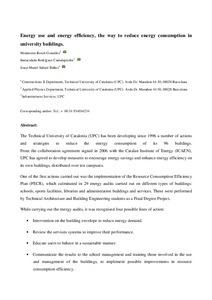 The Technical University of Catalonia (UPC) has been developing since 1996 a number of actions and strategies to reduce the energy consumption of its 96 buildings. From the collaboration agreement signed in 2006 with the Catalan Institute of Energy (ICAEN), UPC has agreed to develop measures to encourage energy savings and enhance energy efficiency on its own buildings, distributed over ten campuses. One of the first actions carried out was the implementation of the Resource Consumption Efficiency Plan (PECR), which culminated in 29 energy audits carried out on different types of buildings: schools, sports facilities, libraries and administration buildings and services. These were performed by Technical Architecture and Building Engineering students as a Final Degree Project. Bosch, M.; Rodriguez, I.; Sabaté, J. Energy use and energy efficiency, the way to reduce energy consumption in university buildings. A: Conference of the Environmental Management for Sustainable Universities. "Proceedings of the ERSCP-EMSU 2013 conference : 16th Conference of the European Roundtable on Sustainable Consumption and Production (ERSCP) & 7th Conference of the Environmental Management for Sustainable Universities (EMSU), 4 – 7 June 2013, Istanbul, Turkey". Estambul: 2013, p. 1-14.